Much of Wybourn is currently experiencing the Streets Ahead project. Street lights are being replaced, road surfaces renewed, some trees are being taken out and replaced and there will be some drainage work. Eventually the whole of the city will experience this. 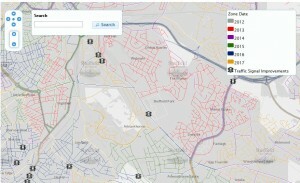 You can see the map of when the work is scheduled to be carried out here. Prince of Wales Road is going to be resurfaced this year. 2016 is when most of the local main roads will be tackled. 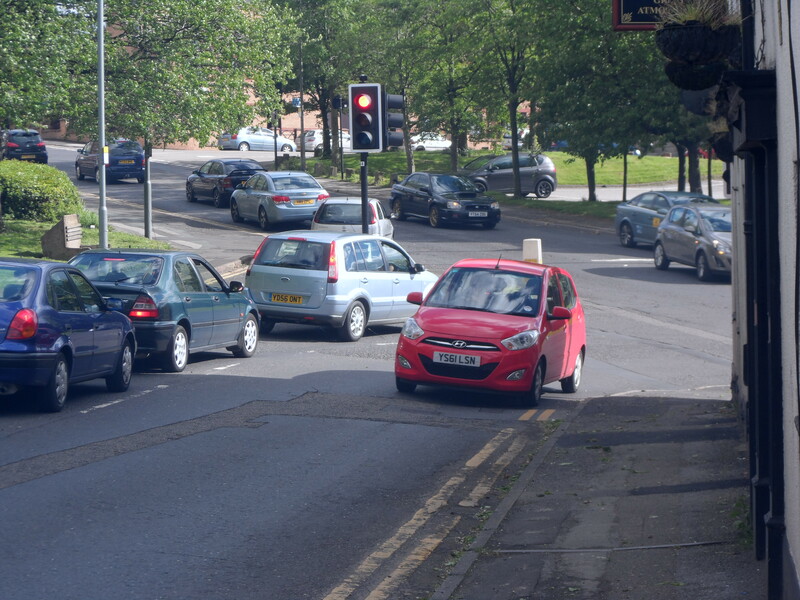 This includes City Road, Duke Street, Granville Road, Talbot Street, Shrewsbury Road and Bernard Road. It’s not until 2017 when the residential streets on the Norfolk Park side of City Road will be tackled. Hopefully by then the Council will have learnt lessons concerning consultation as many residents around the city have been horrified at the destruction of healthy roadside trees. See the article here and the videos of Prof Ian Rotherham here. (This is part 1 of 3). If you are aware of a special tree near your house that is on the pavement, now is the time to be asking the Council what they are planning to do with it- don’t wait for the Council to consult you or one day you may come home and find it’s been taken down. The new street lights will be a big improvement as they are more energy efficient and give white light that is directed down onto the street rather than up to the sky. The road surfaces on many streets are rapidly becoming dangerous, especially for cyclists. It is not good news that most local people will have to wait untill 2017 for their road to be “done”. Car drivers should be extra vigilent of cyclists who may swing further into the road to avoid a pot hole. 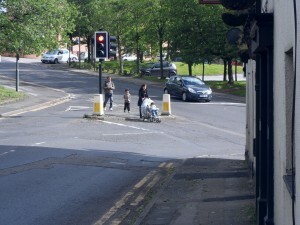 Many pedestrian crossings in the area have already been upgraded from Pelican to Puffin crossings.. These include Duke Street/School Street, Duke Street/Samson Street, Talbot Street /Stafford Street, City Road/Manor Lane, City Road/Dovercourt Road and City Road/Manor Laithe Road. While I welcome these improvements I can’t understand why the lights at the Duke Street/Bernard Road/Talbot Street junction (by the New Inn/Salvation Army/Trades and Labour Club) were replaced without including crossings for pedestrians. I blogged about this way back in 2008, and have raised it at a Community Assembly (Councillors promised to get back to me about it but never did). 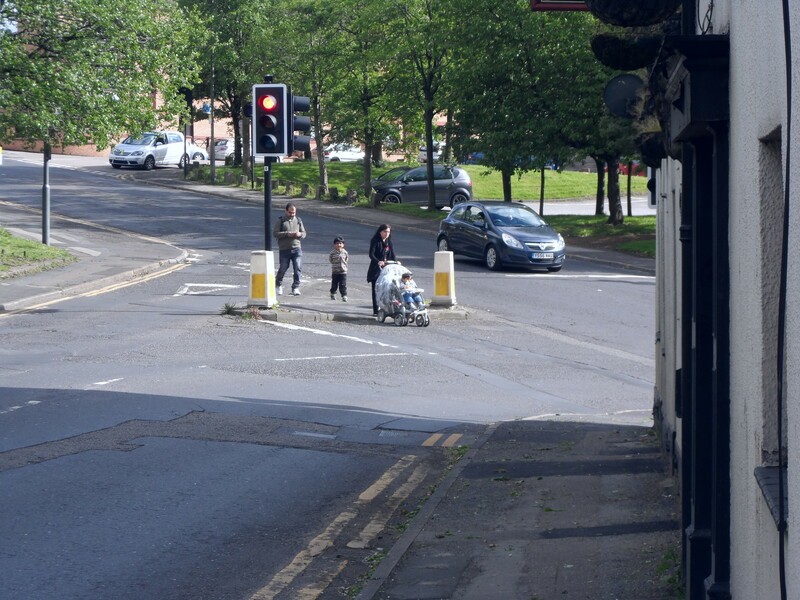 Please write to your councillors about this if you agree with me that it is important to have pedestrian lights at this very dangerous junction. 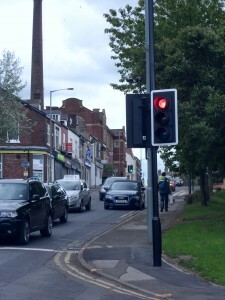 Are there any other major traffic light junctions in Sheffield with no pedestrian lights? The Greens have grave reservations about the PFI scheme which will mean Sheffielders will be paying for the street improvements for the next 25 years with considerable interest. You can read more about the Green Party motion to Council here.